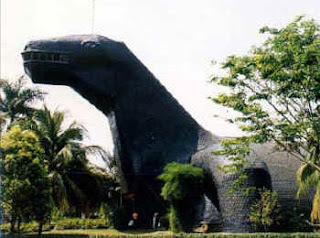 Museum Komodo dragon is a giant building shaped located at Taman Mini Indonesia Indah, Jakarta. Length 72 meters, with a width of 25 meters and height of 23 meters. This building is a museum that presents the various types of fauna fauna in Indonesia such as mollusks, or snails, crabs, reptiles and amphibians. This theater is shaped like a golden snail is located in Taman Mini Indonesia Indah, Jakarta. Imax Theater TMII Golden Conch is Imax theater as a place to watch IMAX films. The theater has a capacity of seating 926 people. Building Giant Tortoise is located in the tourist area of Kartini Beach Jepara, Central Java. This giant tortoise is the vehicle of Sea World or the World Conservation for this attraction. 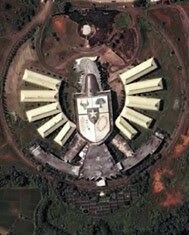 This building when viewed from space will look like a giant eagle, symbol of the state of Indonesia. Indonesia Graha Garuda Tiara located in Cullinan, Bogor, West Java. This building has an area of 5 hectares.